Review: When someone asks me what my favorite tv show is, I always answer "Dexter, seasons 1-4." I have to clarify the seasons because the show really went downhill 5-8. 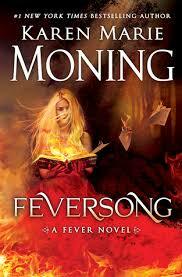 The Fever series is the book version of Dexter for me. I LOVED books 1-5. I literally devoured them and was obsessed with Mac and Barrons (in fact, we just got a foster dog and I named him Jericho Barrons). I recommend this series to almost everyone I know. But the last few books have lost the magic. I get excited for their release and start reading...then, I feel like I'm forcing myself to push through to the end. I don't want to feel this way people! Okay, let's get to Feversong. This is the last book in the series. There was not a lot of dialogue in this book, we are inside characters heads a lot. This was good at times and bad at times. I did enjoy that we finally find out why she is so insecure. But it was a tad boring. Now, what frustrated me. There were a lot of subplots introduced in previous books that weren't addressed. At all. For example, there is no resolution or really any detail regarding Christian, Dageus, Kat or Sean. The attempt to humanize Cruce was frustrating (he raped Mac...ARG). Shazam..just no. I did not care about that entire subplot. I'm not sure why there was a POV from the Seelie Queen. It's clear another book of some sort is coming (there has to be, so much was left hanging). Overall, frustrating read. No doubt I will read anything KMM publishes but I hope she finds the magic of the first books in this series.